If the title of this post sounds arrogant, forgive me: I am using the word ‘position’ literally and I’m talking about a way to pray. Yesterday morning, as distressed as I was over the appalling loss of life in Paris, I was also very disturbed by the French President’s declared intention to start a “merciless war on terrorism”. I am not saying we should not oppose terrorism, even using force if necessary. But I am saying that in doing so we must not become like that which we oppose: merciless. 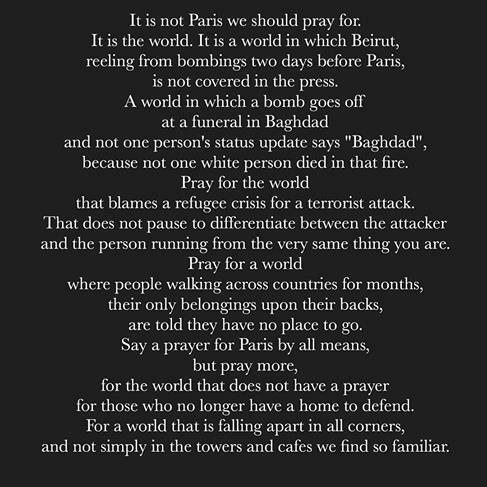 (Nor should we forget that our brothers and sisters in Beirut, Africa and many other places, less familiar to us than Paris, suffer also but do so without the news coverage – however that it a different point to the one I want to principally make here). How is all this linked to prayer? As I listened to the news I stood and prayed the Beatitudes. I have been learning these by heart along with a series of positions that flow from one to another and I find this very helpful. I supposed its a bit like Christian Tai Chi. I have been praying the Lord’s prayer in movement for over a year now and I find it an incredibly helpful way to fully engage with the whole prayer, leaning into the full meaning of every phrase with your whole body. making a cross shape of your whole body, because the cross is the most vivid sign of the Kingdom that there is. As you pray ‘Your Kingdom come’ you raise your arms out to the sides in this way with your palms down at first, pausing to pray silently for every person for whom you want God’s kingdom to come close, then your turn your palms over so they face heavenwards and remind yourself that God’s will is done on earth, as it is is in Heaven. If you are anything like me when I read instructions you will have been trying out that position as I described it. If so you will have discovered, it’s okay… for a moment or two, but trying holding that position…. your shoulders will ache and your arms will feel heavy. On second thoughts, you might actually do yourself an injury so I am NOT recommending you do this! Body prayer is not some form of macho prayer exercise along the lines of ‘see how long I can keep my arms raised to impress God’. Moving your body in prayer, helps you engage with what you are actually saying/thinking/praying (at least that’s how it helps me). Even holding the arms outstretched for just a few moments though is just long enough to remember that praying for others is costly, just as dying for others (as Jesus chose to do) is very costly. Share the pain for just a little bit, both with the Christ crucified and with those who feel themselves to be ‘on the rack’ of suffering. It will remind you that it is Jesus that died, he is the Saviour, you are not. You can only share a tiny bit of the pain of the world as you ask for God’s kingdom to break in to our world. Praying through the Beatitudes using body prayer, the same position (with arms outstretched) is preceded by a big intake of breath recognising that what you are saying and doing is going to require real effort and be very difficult, you do this action as you reach the line: ‘Blessed are the peacemakers, for they shall be called the Sons of God’. Stand like that with your arms held out-stretched to both left and right as if you are trying to form a human link in a chain between warring people and you physically feel a deeper insight into the complexities of reconciliation.